One of the huge advantages of implementing PrinterLogic is the way it streamlines and centralizes distributed print environments. Over the past ten years, PrinterLogic has helped more than 1,500 enterprise clients in a variety of fields do just that. As a matter of fact, multi-site applications are where our enterprise printer management solution excels. A recent TechValidate survey of our customer base revealed that a massive 93% of our customers have more than one office or geographic site. Of that group, nearly half have more than 25 sites, and more than 20% have over 100 sites. When traditional print servers are in place, each one of those additional sites adds an extra—and in our opinion, unnecessary—layer of cost and complexity. By using PrinterLogic to eliminate print servers in your distributed print environment, you and your organization stand to benefit in three important ways. Get rid of upfront hardware costs: Print servers cost money. Eliminate them and that expense is eliminated too—not to mention the future costs of support and upgrades. When it comes to diverse workstations and the printers themselves, PrinterLogic overcomes many of the limitations of traditional print server architectures. That means you're not stuck with particular drivers and conflict-avoidance hardware configurations, which widens the choices available to you when shopping for cost-effective IT solutions. Reduce printer-related service desk calls from remote offices: A user with no IT experience wants to print somewhere within your organization for the first time. That user simply clicks on an icon or a hyperlink, which launches a local portal. One more click installs the nearest printer. No exasperated calls to the service desk, no time spent on painstaking step-by-steps over the phone. Sounds like bliss, no? It's actually an average day with PrinterLogic. It empowers your end users to handle routine tasks themselves—plus it simplifies and consolidates printer management so you can administer permissions, update drivers and keep an eye on queues system-wide via the PrinterLogic Portal before problems arise. Eliminate Print-related WAN traffic: Network printing eats up tons of bandwidth, especially for organizations with multiple geographic locations and a consolidated server environment. PrinterLogic retains many of the benefits of a local print server, such as local spooling. By printing directly from end-point devices, you don't have print jobs clogging the WAN, and everything—including print times—speeds up as a result. In addition, by caching drivers at multiple sites, PrinterLogic tames the data demands of driver installation and doesn't put a strain on sites with limited WAN connections. 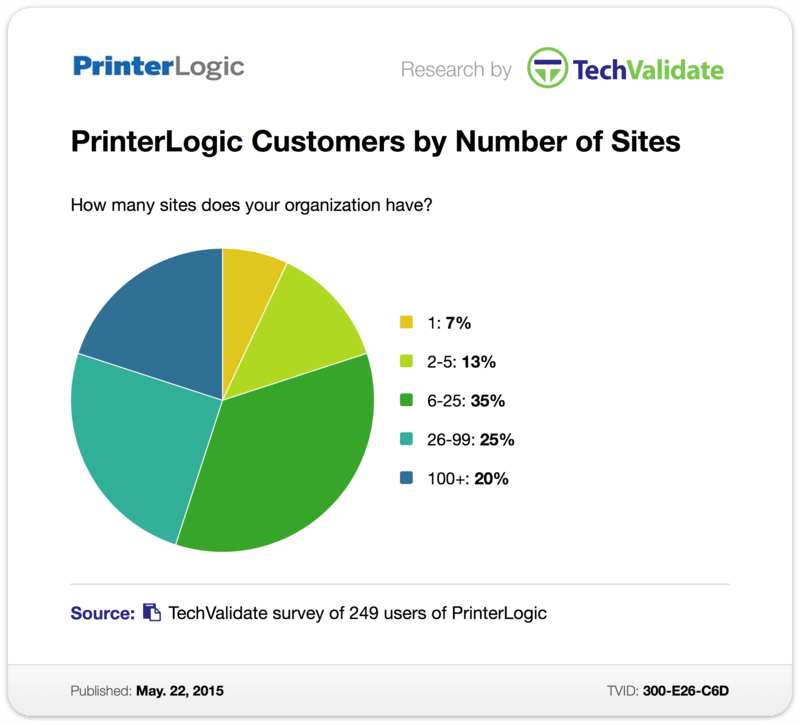 While delivering all these practical benefits, PrinterLogic takes dozens or even hundreds of geographic sites and unifies them virtually through a single, seamless portal that's as intuitive to the end user as it is robust for the IT department. That integration of deployment, installation, admin and monitoring saves time, money and manpower. And from a technological standpoint, it might even bring a greater sense of cohesion to your organization. Ready for that performance bonus?